Amanda Faber uses buttercream to flavor her pastry during the "Patisserie Week" Showstopper bake. She is excited to use vanilla bean as she sees it as a luxury. The decadent pastry cream will be paired with a cherry brandy and pear gelatin. 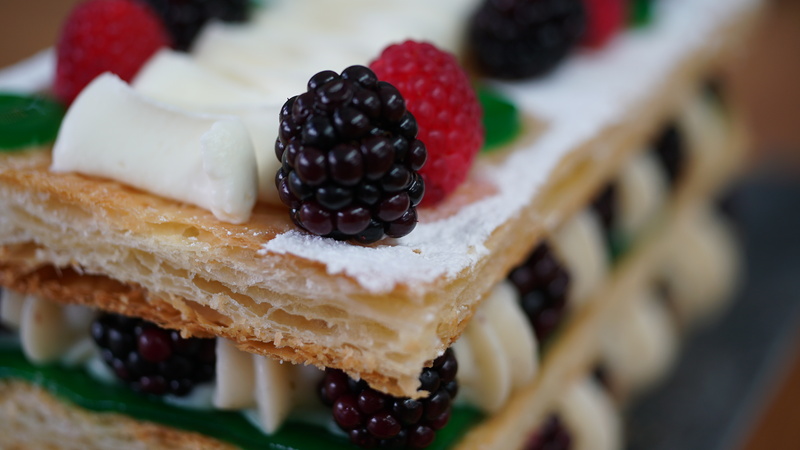 The Mille-Feuille will be topped with black berries and raspberries. Prior to the competition making puff pastry seemed intimidating to Amanda. However, she practiced and is prepared to create a Showstopper bake that will hopefully blow away the judges. Watch the full episode of "Patisserie Week" from The Great American Baking Show Season 2 episode 7. 1. Place 420g flour in a large mixing bowl. Remove half a cup to a stand mixer bowl. Set aside. 2. In the large mixing bowl, cut in the 57g of cold butter until like fine wet sand. 3. In a small bowl, combine the salt and water. Add to the flour mixture. 4. Make a dough, add flour as needed. Knead for 2-3 minutes. 5. Shape the dough in to a 9 inch square. Wrap in plastic and chill for at least 30 minutes. 6. Use a paddle attachment to mix together in the remaining 397g of butter and reserved 1/2c flour. 7. Pat butter mixture in to an 8 inch square. Chill for 30 minutes. 8. Lightly flour a work surface. Roll the chilled dough in to a 12 inch square. Place the butter square in the middle and bring the points of dough around to seal. 9. Turn the dough over. Pat in to a rectangle shape. 10. Roll in to a 20x10 inch square. Flour as needed, but brush off any excess. Fold in to thirds. Turn 1/4 turn. Roll out again. Fold in thirds again. Chill for 15 minutes. 11. Complete six more turns. Chill at least every two turns for 15 minutes, but chill more often if needed. 12. After six turns have been completed, chill for 1 hour. 13. Pre-heat the oven to 400° F/204° C.
14. Cut a piece of parchment to fit baking sheet. Set aside. 15. Roll the pastry out to about 1/4 inch thin. Trim off the edges as needed. 16. Cut in to two pieces. One about 2/3 and the other about 1/3. 17. Place the parchment paper in baking sheets. Using the rolling pin, transfer the dough to the baking sheet. Dock the dough with a fork. Top with another baking sheet. 18. Bake for 20 minutes. Rotate as needed. Remove top baking sheet. 19. Bake for another 10-20 minutes. 20. Once cool, trim the edges. Then, measure and cut in to thirds. 1. Slice and scrape the vanilla bean of it's seeds. 2. In a saucepan, heat the milk and vanilla bean until steam starts to rise. Set aside. 3. In a large mixing bowl, combine the vanilla seeds, eggs, and egg yolks. Set aside. 4. In a small mixing bowl, whisk together the sugar, cornstarch, and salt. Add to the egg mixture. 5. Temper the egg mixture with the hot milk. Keep whisking in the milk until completely combined. 6. Pour the mixture back in to the sauce pan. Heat over medium heat, stirring constantly. 7. Keep whisking until the mixture is thick and boiling. The boiling will look slo-mo because the mixture will be thick. Boil for one minute. 8. Remove from heat and scrape in to a stand mixer bowl. Stir on low with a paddle attachment until cool enough to chill in refrigerator. Cover with plastic wrap, press on the surface, and chill. 1. Combine 1/4 cup of pear juice and gelatin in a small mixing bowl. 2. Heat the remaining pear juice and lemon juice in the microwave. It should be hot but not boiling. 3. Stir all ingredients together until the gelatin in fully dissolved. 1. In the bowl of a stand mixer fitted with a whisk attachment, combine the crème fraiche and confectioners sugar. 2. Whisk until fluffy and thick. Be careful not to over whip, it can turn grainy. 1. The bottom layer is puff pastry. Top it with piped pastry crème and blackberries. 2. Next there is another layer of puff pastry. Top it with the pear gelée, more blackberries, and more pastry crème. Top that with the final layer of puff pastry. 3. Using a piece of paper as a stencil, dust each long edge of the top pastry with confectioners sugar. Pipe the whipped crème fraiche down the center. Decorate with raspberries, pear slices, and blackberries.